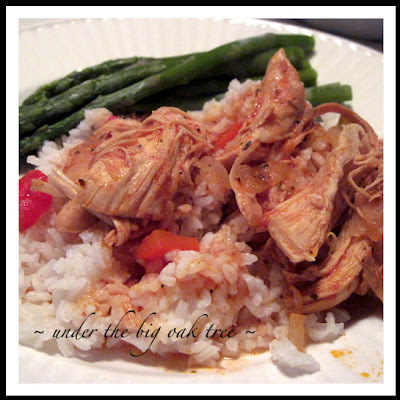 Spanish Chicken is a recipe that Mom made often when we were kids. It's a family favorite and we always knew when we saw that big, glass bottle of Heinz Ketchup that we'd soon be eating Spanish Chicken for dinner! Although, I've made Spanish Chicken many times over the past several years, I'm just getting around to sharing it with you now. You see, this dish isn't really a recipe, it's more of a throw-it-together sort of meal. When I threw it together on Saturday, I wrote down the ingredients and measurements as I went along. I'm a little fuzzy on the cooking times, so you'll have to use your judgement on that. Place chicken in a large pot, top with sliced vegetables and seasonings. In a seperate bowl (I usually use a clear bowl or measuring cup), mix together the ketchup and water. Pour ketchup/water mixture over the chicken and vegetables. Bring to boil over medium-high heat. After 10 minutes, reduce heat to low and cover. With tongs or a slotted spoon, remove chicken from the pot and put into a bowl. Once it's cool enough to handle, start removing the meat from the bones in large chunks. When finished, shred slightly. Not too much, they'll still break down while cooking further. This is a good time to taste the sauce and adjust to your liking. Add chicken back to the sauce and continue to simmer, covered for another couple of hours. Serve over rice, noodles or potatoes. Mom usually made Spanish Chicken using legs and thighs. We prefer the chicken breasts. Don't be tempted to use boneless chicken breasts. You need the flavor from those bones to mix with the ketchup and water. Trust me! A few years ago, Joe kept insisting that this would be so much easier (and better) using boneless chicken. I kept telling him no, but gave in and made it without the bones. It was good, but he did admit that it's much better with the bone-in chicken. You could certainly skip picking the chicken from the bones, if you like. But I prefer to remove the bones, since as it cooks further, the chicken starts to fall apart making it more difficult to fish the bones out! Don't forget to taste the sauce before you add the cooked chicken back to the pot. And adjust the seasoning as needed. I originally started with 2 cups of ketchup but after tasting it, I realized it needed a bit more. I usually add a bay leaf and some sun-dried tomatoes to the pot, but we were all out of both this time. This is a good clean out the fridge recipe. In the past, I've added half a can of diced tomatoes that were left from another recipe. Or a couple tablespoons of tomato paste that was left in the fridge. Add what you like. It is good to see you, I am glad you could make it over today. Your Spanish Chicken looks really delicious. I can see how it could become a family favorite. Thank you so much for sharing at Full Plate Thursday and please come back!